Male scammers are always widowers, tall, attractive, Christian and looking for older women. As you can see from the below scammer profile we recently busted, MUCH older. Let's face it, a guy who looks like that is not looking for his grandma. 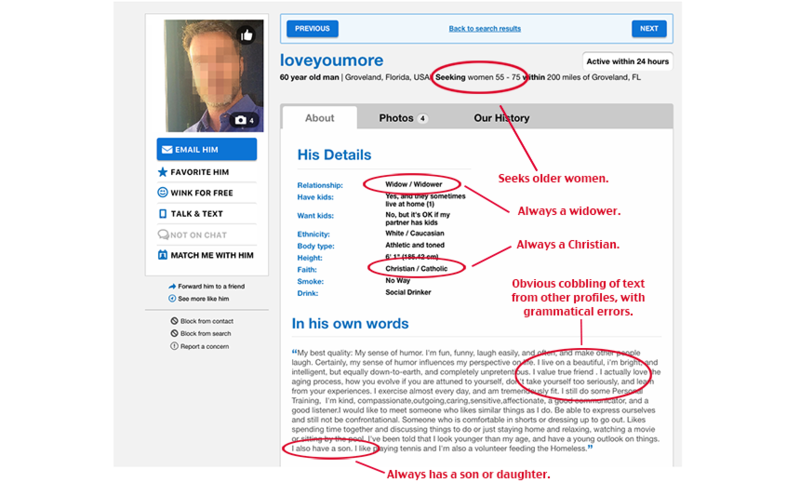 His photo (we have it pixelated to protect the identity of the person whose photo was stolen for this fake profile) is also younger than a 60-year-old man, too. 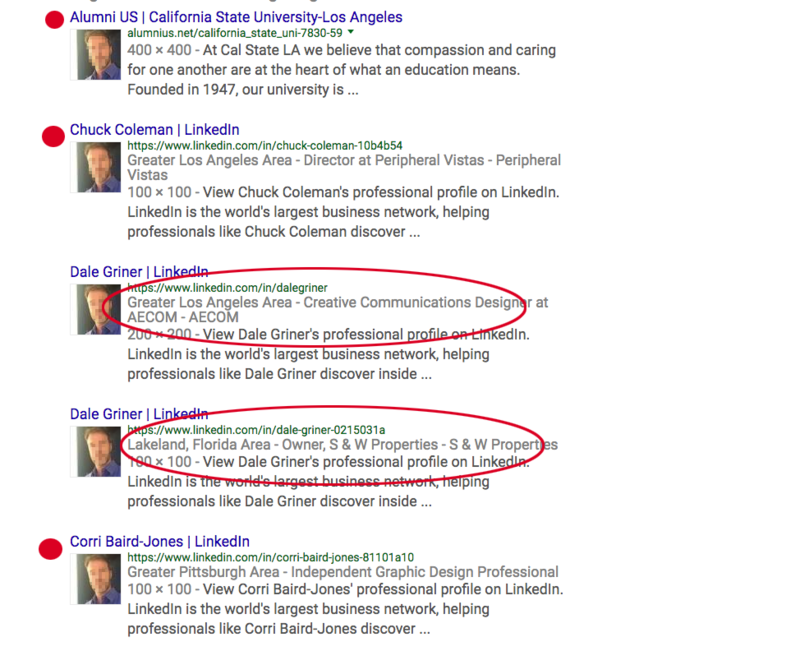 Scroll down to see the Google search results below the "More About Him" section...Proof that this profile is a scam! 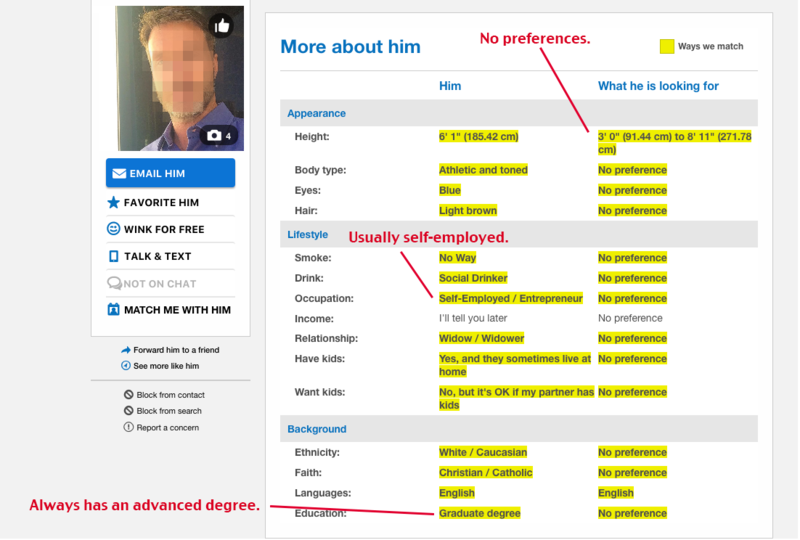 Note in their stats and preferences section that he has NO preferences for who he wants to me. None! That's to keep his net as wide open as possible. Scammers usually portray themselves as self-employed, which gives them the flexibility to tell their prey that they are on a contract in a foreign country, but will be back in the States in a week or so, and of course "would love to meet". So now that our handsome, dream guy here scores on all signs that he's a fraud, the final step is to Google him and see if we can find more. Voilà! Seems like this guy's photo has been stolen on more than one occasion! Next step: Notify Match that this guy has to go. Why do I have to do their work for them?